One of my passions is painting. 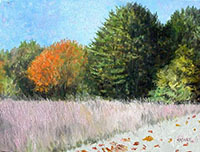 The purest form for me is to venture out into the elements and paint. The captured light and color cannot be equaled in a studio. I also find a silly joy when bugs get stuck in the paint and I use them as texture. 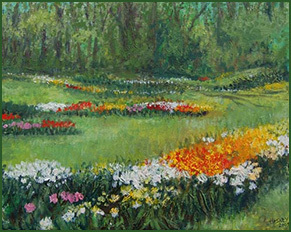 Spring Celebration, oil on canvas, 11" x 14". Available for sale. just north of New Hope. Sometimes there isn't an opportunity to do more than take a picture when I am out in the elements. Sometimes, I want to work and rework a painting over time. That is when I sequester myself in my studio to paint. My studio is in a back building behind my house. It is my sanctuary. Lentaboden, oil on canvas, 24" x 30". Available for sale. 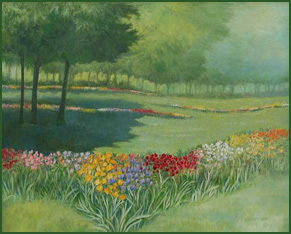 Painted from one of my photos of Lentaboden tulip farm. Every mother's day before he moved away, my brother would take my mother to Lentaboden to pick out bulbs from the display gardens as his gift. I would tag along to share the day and take pictures. I originally painted this with my brother in the picture, holding an umbrella. My mother has that painting. I repainted it without him in scene after he moved to Brazil. For all of my artistic life, I've used art as a way to express myself and to document my life. Sometimes the subject matter is based on experiences, sometimes it may be a portrait of someone I care for/admire, and almost always there is a story behind the inspiration. Ricky shredding Blue Rocks, mixed media/sculpture, 48" x 24". Available for sale. This a composite of multiple subjects. I staged and photographed Ricky riding his skateboard. I photographed the Pulpit Rock overlook at Blue Rocks in Lenhartsville, PA. I acquired Ricky's old skateboard and an old pair of my shoes. I carved the hand that protrudes from the 2D surface. All combined into a 3D painting/sculpture. I have been doing technical illustrations since 1982 when I was in art school. Back in the day, I used an airbrush and friskets. These days, everything is done in Illustrator and Photoshop. I have been doing technical illustrations at my main job since 1997 but those drawings are secure material and cannot publicly released. I have also been doing medical/scientific illustrations for research publications for the past few years. Published. I get a 2-3 page word doc of scientific descriptive text, I try to pre-visualize as best I can, and then I illustrate a first version. I submit a first draft and the researchers give me feedback and I modify until their needs are met. 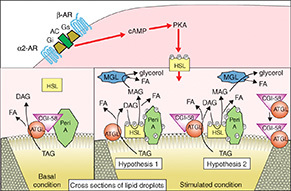 This illustration is about lipid droplets. I am a photographer primarily to capture resource material for my paintings and drawings. There are times where I do photography for commercial purposes. I have done product shots, book covers, and photos for print and web publications. Two covers for The Nation's Report Card. I came up with the concept, set up the scenarios, and photographed them. These are just two of many that I've done for The Nation's Report Card. There are two sides to every story. My art has two sides, one side is fine art and the other commercial art. Both have very important places in my life. My fine art allows me to express myself. My artistic talent was noticed by my second grade teacher who told my mother to watch and nurture my gift. My fine art allows me to freely express myself, no matter how bizarre the intentions. I can paint, draw, sculpt and more using whatever color, form, texture that I want in any medium I want. My commercial art side is how I've been lucky enough to generate income for myself for decades. I've worked in type houses, print shops, and newspapers. I've worked as a silk-screener, an air brush artist, and sign painter. I "went corporate" and have been employed full-time for over 20 years providing graphics, technical illustrations, design and layout, and new product development. It all has art where being creative has a price tag.